There are many different lengths to choose from: Short Length, Asymmetric Length, Floor Length, Sweeping Train, Court Train, Chapel Train, Semi Cathedral Train, Cathedral Train, Royal Train and Watteau Train. “Short length” can be used to describe a number of lengths, from dresses with hemlines falling mid-calf (also known as “tea length”), to knee length gowns, right up to “mini length” dresses, where the hemline is anywhere above the knee. This length is considered less formal than longer lengths, and is generally suitable for both casual and semi-formal occasions. It is the most popular length for both graduations and homecomings. Try It: If you want to show off your amazing legs, this length will allow you to do that. If you want a really simple dress, teamed with some amazing accessories, a short dress is ideal as it will show off your fabulous shoes! Avoid It: If you want a more dramatic style, or are attending a particularly formal event, you may prefer to choose a longer length. While a knee length dress will be considered acceptable for most occasions, dresses that are shorter than this may not meet the dress code of the event you will be attending, so make sure to check before you buy. Also referred to as "Asymmetrical Length", "High Low" or "Hi-Lo”, this style features a skirt which is longer in some places than it is in others. Normally, it is the front part of the skirt which will be shorter than the sides and the back, however, in some cases, the dress will be shorter on one side than it is on the other. Depending on the dress, the length may increase or decrease gradually, or may change abruptly. The shorter part of the skirt normally falls above the knees, with the longest part reaching the floor, but again this will differ from gown to gown. Try It: If you are looking for a fun alternative to a long length gown, then this is the choice for you! If you really want a floor length dress, but still want to show off your fabulous legs, then why not give this style a try? Avoid It: If you do not feel confident showing off your legs, avoid this style, as it will draw attention to them. If you are attending a more formal occasion, check the dress code before buying an asymmetric length dress, as it may be considered too casual. As the name suggests, this length either reaches, or stops just above the floor, meaning it could also be referred to as ankle length. This length is perfect for both formal and less formal occasions, and is considered sophisticated and elegant. A split can be added to the side of the dress, which will both show off your legs, and make the dress sexier. Floor length wedding dresses are ideal for semi-formal weddings, and more casual nuptials, whilst floor length gowns in general are suitable for most formal and semi-formal occasions. Try It: Floor length gowns look good on all heights and body shapes. If you are less confident showing off your legs, this style will hide them. If you want a formal gown, but are worried about a train getting caught on the floor, or becoming dirty, then this is the length for you. Avoid It: Whilst suitable for most formal occasions, you may wish to consider a train if you are attending a particularly formal event. A floor length gown may look out of place at more casual events. Also known as a "Sweep Train", "Brush Train" or “Duster Train”, this is the shortest and most subtle type of train. It extends from the hemline of the gown, and gently sweeps (or brushes, or dusts) against the floor, hence the name. Trains can add formality to a dress, as well as a bit of drama, and the sweeping train provides this without restricting your movement. The shorter length of the Sweeping Train means it is a good choice when attending an event that perhaps formal enough for one of the longer trains. Try It: If you want the formality of a train, but you don't want the restricted movement that longer trains can cause, give the Sweeping Train a try. If you are getting married, and your bridesmaids will be wearing floor length gowns, having a slight train will further differentiate your gown from theirs. Sweeping Trains can offer the perfect compromise for brides who are having an outdoor wedding, but still want the sophistication of a train. Avoid It: If the event you are attending will be very formal, you may wish to consider a longer train. Similarly, if the event will be a more casual one, a train may look out of place. This train falls from the waist, and extends approximately 3ft in length behind the dress. Like the Sweeping Train, the Court Train allows you to enjoy the formality and drama of a train, without the restrictive movement associated with longer trains. It is suitable if you are attending a more formal event, or if you are selecting a wedding dress for your formal or semi-formal wedding. Try It: If you want to add the formality of a train to your gown, whilst ensuring it is still practical, and without limiting your movement, this shorter train may be the perfect choice for you. Avoid It: If you are attending a less formal event, you may wish to consider the shorter, Sweeping Train instead. Similarly, if you are having an outdoor wedding, a Court Train may drag across the ground too much, and get caught - a Sweeping Train would be a better choice. The most popular train length amongst brides, this train falls from the waist, and extends between 3.5ft and 4.5ft in length behind the dress. 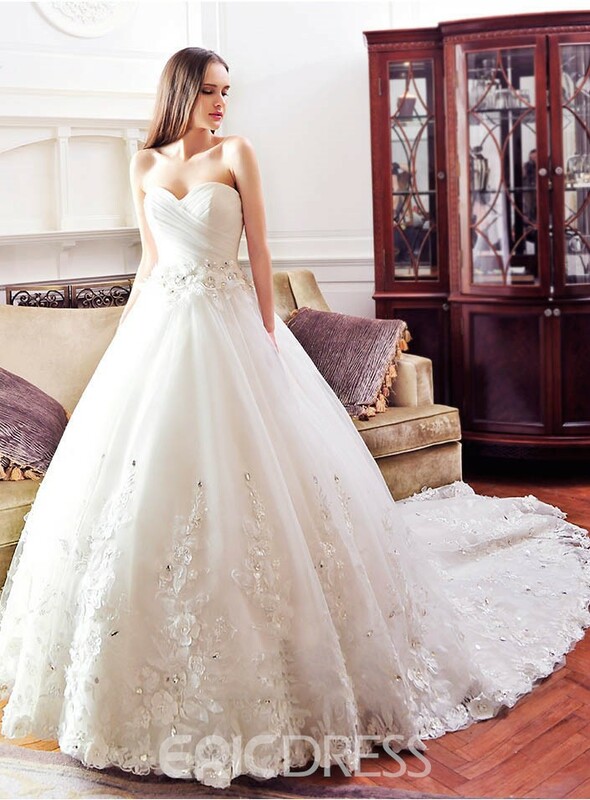 It is considered a “longer train”, adding that touch of drama and elegance to your dress, but at the same time it’s considered “not too long”, as it is still relatively easy to manage, move in, and walk in. It is suitable for more formal events, as well as formal and semi-formal weddings. Try It: A chapel train will look good on all body types and heights. Perfect for adding a touch of drama to a prom dress or evening gown, this length is one to try if you want to make a dramatic entrance without compromising on movement. Avoid It: If you are a bride looking for something a bit different, bear in mind this train length is the one most often chosen for wedding dresses. Not quite as dramatic as the Cathedral Train (see below), the Semi Cathedral Train falls from the waist, and extends between 5ft and 6ft in length behind the dress. Movement will be somewhat restricted with a train this length, but for the most part you should be able to manage your train without the help of others. Try It: If you want the show stopping elegance of a Cathedral Train, but are worried about being able to manage a train of that length, this may be the perfect compromise for you. Also, as there is less length to a Semi Cathedral Train than a longer Cathedral Train, this choice is perfect for petite brides who still want the dramatic entrance that a longer train can provide. Avoid It: A train of this length will look out of place at any event that is not of a particularly formal nature, or on a bride at a casual wedding. Due to its length, it is almost inevitable that someone will step on your train at some point, so don’t be surprised when it happens! This train falls from the waist, and extends between 6.5ft and 7.5ft in length behind the dress. The longer length of this train means your movement will be very restricted, so you may wish to consider buying a gown with a removable train, or a bustle. Alternatively, brides with trains of this length often choose a second gown to change into for the wedding reception. This length tends to be most common on wedding dresses chosen for formal church ceremonies. Try It: This is one to go for if you want to make a dramatic entrance on your big day! If you will be getting married in a particularly formal venue, a train of this length will ensure your dress fits right in! Avoid It: Having so much fabric trailing behind you will give the illusion that you are shorter than you actually are, so this is a length to avoid if you are petite - instead you may wish to consider a Semi Cathedral Train. Also known as a "Monarch Train", "Royal Cathedral Train", and "Grand Cathedral Train", this dress has a train that falls from the waist, and is generally between 9ft and 12ft in length (although it can be much longer)! It is a favorite with royalty, hence the name. Unsurprisingly, movement is limited in a dress of this length, so it is common for brides that choose a royal train to have their bridesmaids help them down the aisle by carrying the train, and to later change into a second dress for the reception. Suitable for only the most formal of occasions, this length will guarantee that you are the center of attention! Just make sure your venue is long enough - you don't want to finish walking down the aisle and find your train hasn't quite finished making its way through the door! Try It: If you want to ensure your wedding guests remember your entrance for many years to come, this is the length for you! Avoid It: If you are planning to dance the night away, this is one to avoid as your movement will be very restricted. Shorter ladies will be made to look even shorter with a train this length. Unlike the other trains mentioned above, the Watteau Train is unique, in that the train falls from the shoulders or upper back. Although some Watteau Trains will be the same length as the rest of the dress, it is more common for the train to extend beyond the length of the gown. Longer Watteau Trains can give a more dramatic look and feel to a gown. Watteau trains are popular with brides who are having less formal, outdoor, or beach weddings. Watteau Trains are usually detachable, giving the wearer the option of two styles of dress in one gown. Try It: Watteau trains are one of the least common types of train, so this is one to consider if you fancy something a bit different. Avoid It: If you are a bride searching for a wedding dress for a particularly formal wedding, this style may be a little too casual for you.